Bow Wow Meow pet tags - excluding Bling - are guaranteed for replacement for 5 years from the date of purchase against breakage, and for life against fading. Please avoid having multiple metal tags on your pet's collar which may rub against each other and cause damage to the tag or engraving. Brass tags always tarnish and will require occasionally polishing. For dogs who swim regularly we recommend stainless steel tags. Our Bling tags are guaranteed against breakage for 3 years and for 1 year against the loss of any crystals during normal use. Bling tags should not be worn while swimming or at particularly active times - keep them for special occasions! If we have made a mistake on your tag, or we have sent you the wrong tag, simply fill in our tag correction form and we will gladly send you a replacement tag free of charge. If necessary we will ask you to return the incorrect tag to us. If you are not happy with your tag and would like a refund rather than a replacement, please return it to us within one month for a full refund. Bow Wow Meow eZeClips are strong and robust and should last for years under normal conditions. Check your eZeClip to make sure that the spring is not loose and in good working order, and that it attaches the tag to the collar ring securely. If it appears to be faulty in any way, email us a photo of the faulty eZeClip and we will dispatch a replacement within 24 hours. 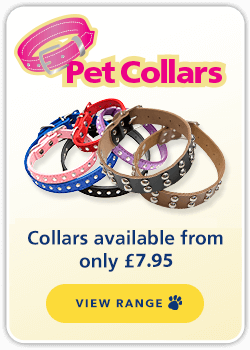 If you wish to change the size or colour of your pet collar, return unused to us for exchange, including the details on the packaging slip. We recommend retaining a proof of purchase for your return. We aim to process exchanges within 48 hours of receipt. All prices include full engraving and delivery. We aim to dispatch all orders within 24 business hours. Tags and eZeClips are sent by Royal Mail First Class Post in the UK or airmail outside the UK to the mailing address provided. Pet Collar bundles (pet collar + pet tag + FREE eZeClip) are sent by Tracked Signed For post. If you have not received your order in the UK within 5 working days of placing your order, or within 10 working days if outside the UK, please complete and submit our Correction/Replacement form or email us advising us of your order number. We require notification of non-delivery within 3 weeks of the order date. Ready to start shopping? 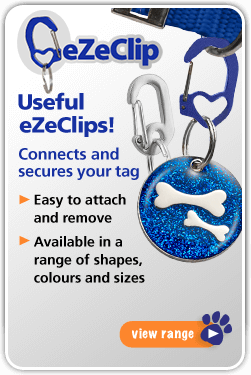 You are sure to find the right tag for your pet from our five tag ranges and why not purchase one of our Original or Heart eZeClips in one of 6 colours, to make attaching and removing the tag easy?